Pretty impressive C.V., huh? 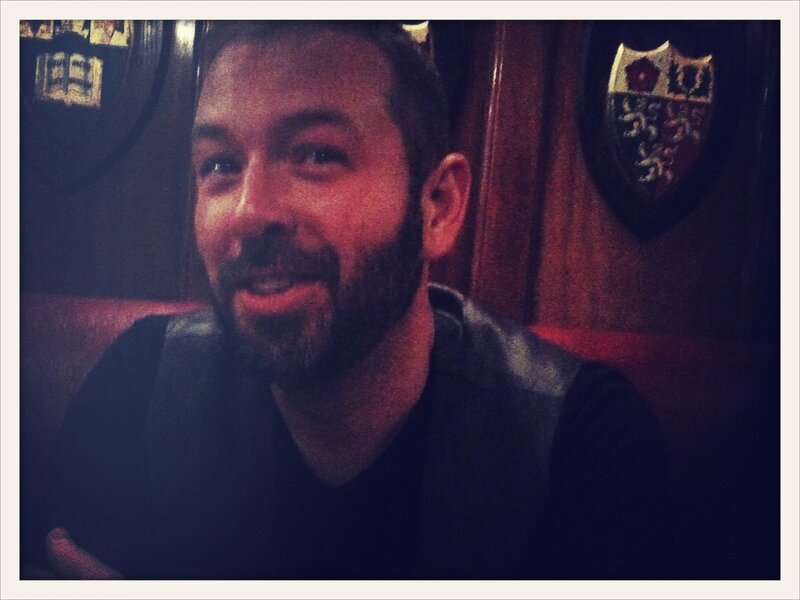 So what happened that soured me on Harry’s? A jerk waiter. I arrived with my entourage, ordered my free shot of Maker’s Mark bourbon (a gift to every American citizen to cross the threshold on the Fourth of July), and then decided to order one of the two specialty cocktails of the day (as prominently advertised on the bar’s website that day): the General Washington, what promised to be a delectable concoction of white cacao, coffee liqueur, amaretto, and Maker’s Mark bourbon. What ensued was a little surprising and pretty rude, even by the standards of my French companions who have spent a long time in Paris dealing with infamous Parisian-style service. When I ordered my General Washington, I was met with a look of complete incomprehension, even after attempting a French pronunciation of the name. “It’s on your website,” I explained in French. “I don’t know it. The drinks are on the mirrors.” (in a very dismissive tone while motioning to the mirrors behind the bar … which, it goes without saying, are completely useless to someone seated at a table without a view of the mirrors behind the bar) “So, it’s not possible?” “The drinks are on the mirrors.” (in a tone of reinforced dismissal) “Oh, okay. That’s fine. Nothing.” It’s hard to express the tension in that moment, because so much of it was about tone and body language, but hopefully you get the picture. I was a little stunned, too stunned to have had the presence of mind to tell the jerk to ask his bartender since it wasn’t really a question of whether he knew the drink. But what’s done is done … and I’ll probably never go back. Maybe I should have ordered the General La Fayette? We went to B.I.A. 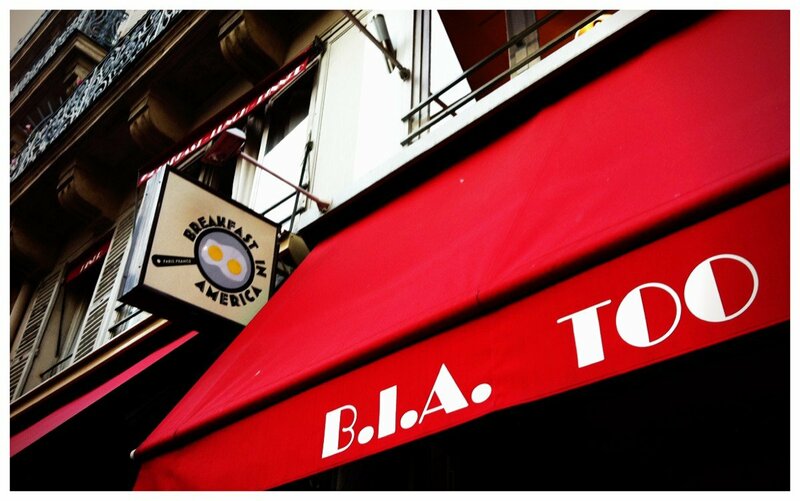 Too, the second of two Breakfast in America locations in Paris, situated in the Marais on rue Mahler not far from the Saint-Paul Métro station. That does sound pretty good to an American stomach, so I’m not going to write off B.I.A. just yet. Next time, though, it’s going to be the pancakes and not the veggie burger that I order. So what does one do on the Fourth of July after walking out of the oldest American bar in Paris feeling insulted, and eating a disappointing veggie burger in the best pancake joint in town? One goes to Amorino for Italian artisanal ice cream made by a French company, of course! Viva l’Ameri … euh … Vive l’Amériq … euh … Long live America! Ahahaha at the waiter. I understand that it might have been a bit tense at the time, but pretty funny now. I have to ask – what is a standard French Breakfast? Croissants? Yeah, it makes for a good story. As for a traditional French breakfast, fairly carb heavy. Sometimes you get multiple kinds of bread and pastries with jam and butter. Definitely NOT for the gluten-free! I would probably last about 3 minutes there. Between a) being gluten/dairy-free, b) having no patience for the French work environment, and c) having failed French miserably. So I’ll stay far away and live vicariously through you – the French thank you. Enjoy the pancakes when you get them! I expect an epic post!